Consider the lilies of the field, says the Bible. And Bermuda once did just that. Christ’s parable about the lily’s elegance surpassing Solomon in all his glory helped to establish a thriving Bermuda industry. As late as the 1890s, Bermuda controlled fully 90 percent of the lily market in the United States. 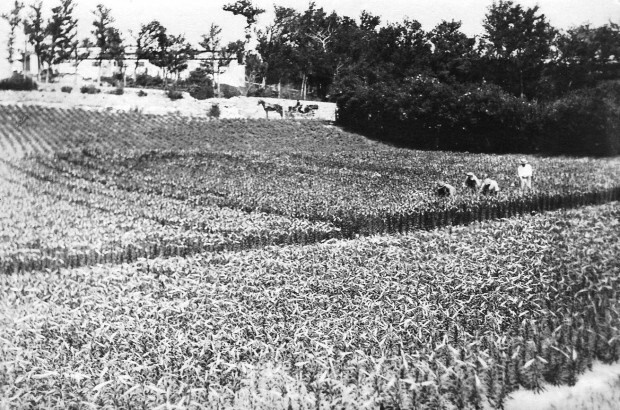 Although Bermuda totals under 15,000 acres — and only 4,000 acres were under cultivation at the time — the island turned itself into a thriving winter garden for the US East Coast in the days before refrigerated box cars allowed for the easy transportation of fresh crops from the American South and West by rail. In the late 19th and early 20th centuries Bermuda exported onions, potatoes and Easter lilies — 90 percent of its crops were sent by ship to New York for distribution up and down the East Coast. And both cut flowers and lily bulbs were by far Bermuda’s most lucrative cash crops. 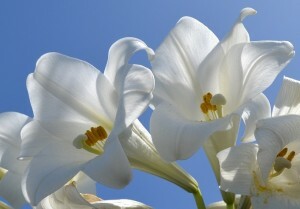 Easter lilies — now also known as Bermuda lilies– were introduced to the island from Japan in the mid-19th century. The large, white trumpet-shaped flowers had become a symbol of purity, hope, innocence and peace in the Christian tradition. Aside from Christ’s parable about the flower, it is said white lilies sprang up in the Garden of Gethsemane where Jesus wept in the last hours before he was betrayed by Judas. Another legend claims that the white lilies grew from the repentant tears shed by Eve upon her departure from Eden. Commercial production of the bulb began in Bermuda in the mid-1800s. Within a few decades Bermuda was routinely being referred to as “The Easter Lily Island” – or simply ”The Easter Isle” – in American and Canadian newspaper reports on what had become one of its largest industries. “How many lilies are grown in the Bermudas is a difficult question to answer,” said a Baltimore paper in 1896. “The figures run way into the tens of millions. They grow like weeds, and if it were merely a question of producing lilies the Bermudas could easily flood the world with them from one year’s end to the other. An acre of land was said to be capable of producing 40,000 marketable bulbs — although it took as long as four years to produce larger bulbs of nine-to-14 inches in diameter from which sprang the tallest lily stalks crowned with multiple blossoms. “The earliest bulbs are dug about the middle of June, though they are not fully ripened until fully three or four weeks later,” reported the Baltimore newspaper. “The tubers must be picked as soon as they are taken out of the ground, because half an hour of glaring sunshine would ruin them irretrievably. Bulbs were sorted by passing them through boards with four holes of different diameters bored into them to gauge the various sizes. “The lily fields are covered with plants varying in height from a few inches to two or three feet tall,” said the newspaper. “The small ones are the stalks of the young bulbs. The taller ones are sent to the United States for the Easter trade. It was only in the last years of the 19th century that local lily farmers hit upon the idea of sending cut flowers to the US to compete with lilies being grown from Bermuda bulbs by American florists. As steamers made the trip from Bermuda to New York in just 70 hours, the island’s lily growers were able to send their flowers to the East Coast without much risk of them withering. And they were able to send them in such large quantities — and sell them at such low prices — that American growers were almost completely crowded out of the field. “When received here they are in bud form,” said the Baltimore newspaper, “packed in air-tight cases, and each individual bud is carefully wrapped in cotton. But in 1899 the Bermuda lily industry was crippled by a disease which devastated the crop — and the culprit remained unidentified for almost 30 years. It wasn’t until the 1920s that Bermuda Agriculture Department plant pathologist Dr. Lawrence Ogilvie determined a virus — not an aphid as had previously been thought — was responsible for decimating the lily-bulb crop. By 1927 Dr. Ogilvie had been able to re-establish the Bermuda lily as a major export crop, with more than 6000 cases of bulbs and flowers being shipped to New York that year. But Bermuda was never able to reassert its dominance in the lily market. Almost a decade earlier an American First World War veteran had helped to establish a viable lily industry in the US using Bermuda bulbs. In 1919 Louis Houghton brought a suitcase of hybrid lily bulbs from Bermuda to the southern coast of Oregon and gave them to family and friends to plant. The climate there was ideal for growing the lily and the flower could now be easily transported around the country by rail with no risk of it withering. Bermudian lily growers could not hope to compete with American farmers whose landholdings sometimes surpassed the island’s total acreage. In the late 1920s and early ’30s Bermuda’s agricultural sector began to decline even as the new luxury resort tourism industry started to blossom. By 1945, more than 1,200 growers from the West Coast of the US were producing their own bulbs in the thousands, then hundreds of thousands, for the commercial market. Nowadays, a concentrated group of growers, mostly from along the California-Oregon border, have created an area known as the “Easter Lily Capital of the World”. There, they produce 95 percent of all bulbs grown in the world for the potted Easter lily market. Today Bermuda only grows lilies commercially for domestic purposes — although a handful are still exported: every year Buckingham Palace receives bouquets of the flowers as an Easter gift for the Queen from the people of Bermuda. Thank you Bernews, yes all of you for a glimpse back in time and reminding us about what the weelend is really about. A blessed day too all. Two Lilies caught the #8 bus Thursday morning . They were in full bloom . I lived in Bermuda during 1960-61, when I was 4 & 5 years old. The fields of Easter Lilies are something I always remembered, and told people about. They would always ask me why they were there, and I never knew until today. Now I can tell everybody all about it. Great article.